Pacifica Affiliate, WXOX 97.1FM is an experimental radio station locally produced in Louisville, Kentucky. In three years the station has become a revolving door of artists, arranging audio illustrations through its airwaves for all to hear. Building a radio station from the roots is no easy feat but an incredible journey to pursue. “You can’t go to the store and buy a station,” voices Sharon Scott, WXOX general manager. For her, the process has been eye-opening, beautiful, inspiring, unpredictable and a risk worth taking. 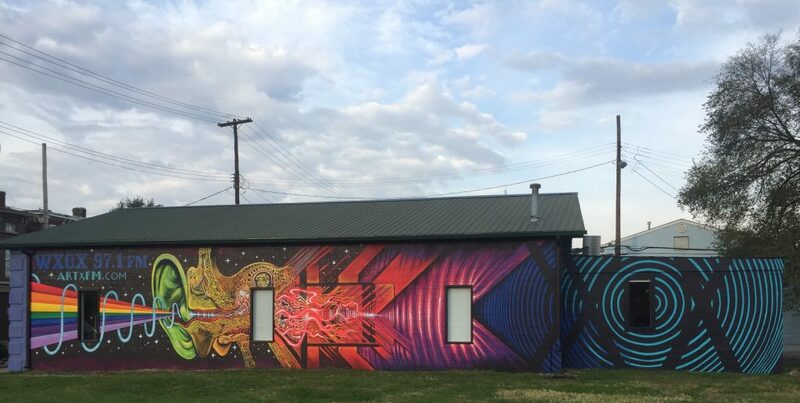 Recently, the station commissioned a stunning mural painted by artist Wilfred Sieg. After pop-up events, couch surfing, and occupying a donated location, WXOX finally found a home in downtown Louisville. At over a hundred years old, it’s a beautiful one-story building and now the outside matches the eclectic variety of art happening inside and on air. Mural by Wilfred Sieg of The Art Cartel. Facilitated by Louisville Visual Art (Mural Art Program.) Photo by Sean Selby. WXOX originated when a college radio station: WRVU 91.1 FM Nashville “the Student Voice of Vanderbilt University,” was under threat of being sold to NPR. As an alumni of Vanderbilt University, Sharon viewed it as her personal mission to save the station and began a non-profit group to fight for it from being sold out. Ultimately they lost but for for the Louisville community, Sharon’s tenacity would become the foundation they needed. When Sharon was a student, the station had meant a lot to her as an artistic outlet. That’s when a thought surfaced: why not create a station from the ground up? 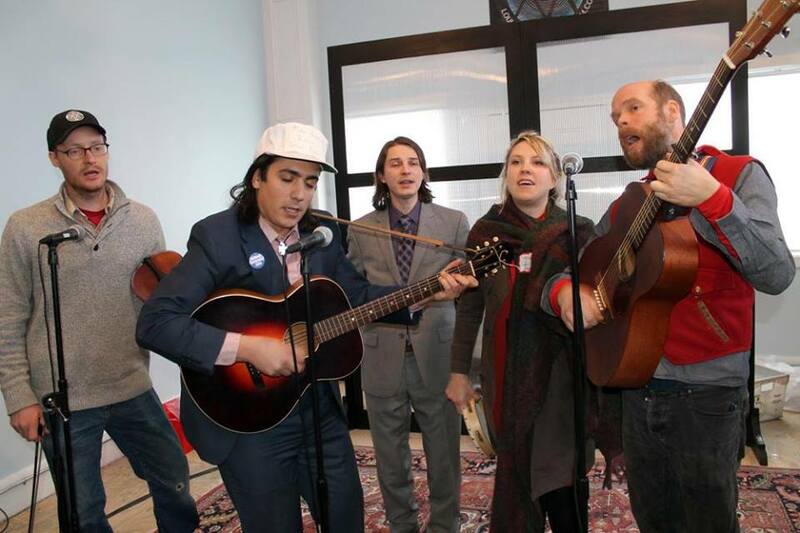 To begin a community radio station there needs to be a non-profit group backing it. Sharon already had that experience underneath her belt and formed another nonprofit: ARTxFM, Inc. Her vision for the new station was the use of radio as an art form, an “open canvas” for musicians, DJs and anyone with something meaningful to express. 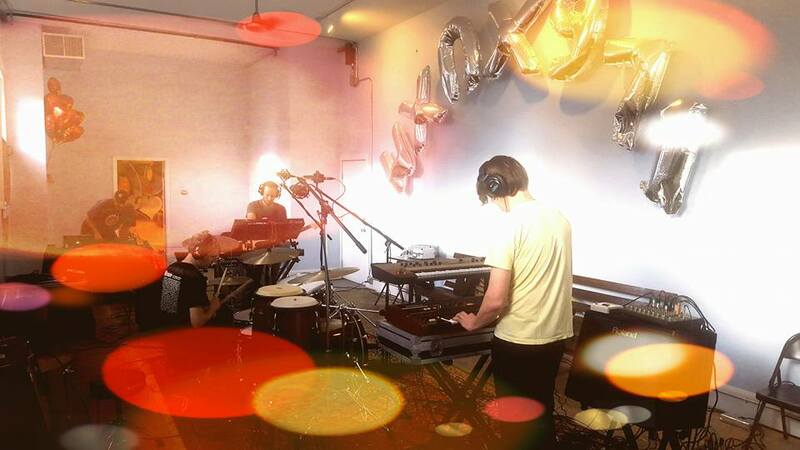 Performance from Watter in the WXOX Flight Deck. ARTxFM was encouraged by Kris Kimel to broadcast online until the Federal Communications Commission (FCC) allowed them to launch on the FM dial. Their first online broadcast was at Kimel’s IdeaFestival in the lobby of the Kentucky Center for the Arts. Their first guest was R & B star Janelle Monae. 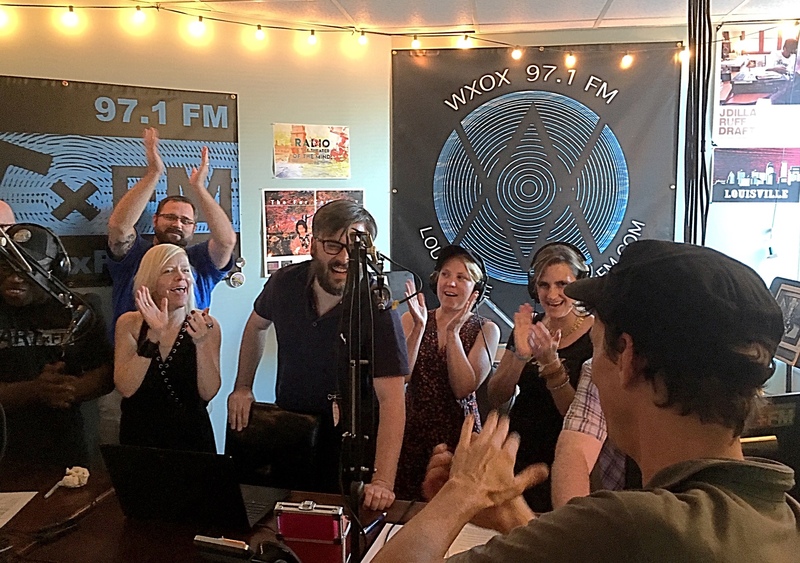 After broadcasting online for three years, building up their repertoire and listenership they were finally able to launch on the FM airwaves and become the station we know today: WXOX 97.1FM. Their launch date was February 14, 2016. Over the past three years the station has seen many changes, from venue to daily programming, affiliations, volunteers and other additions. WXOX has over 120 volunteer DJs along with others who make up their board or do work behind the scenes. Most recently the station has transformed part of the building to be a live performance space. Bonnie Prince Billy and The Hundred Proof Stringband in the WXOX 97.1 performance space, Flight Deck, for their launch event. The station has become a platform and voice for the Louisville community. Now instead of being consumers of radio, it has fostered people to become producers. The station also affiliates with the Pacifica Affiliate Network (PAN). Sharon adds that PAN binds community radio stations together and offers a wealth of programming from different perspectives which is nice when you’re airing 24/7.